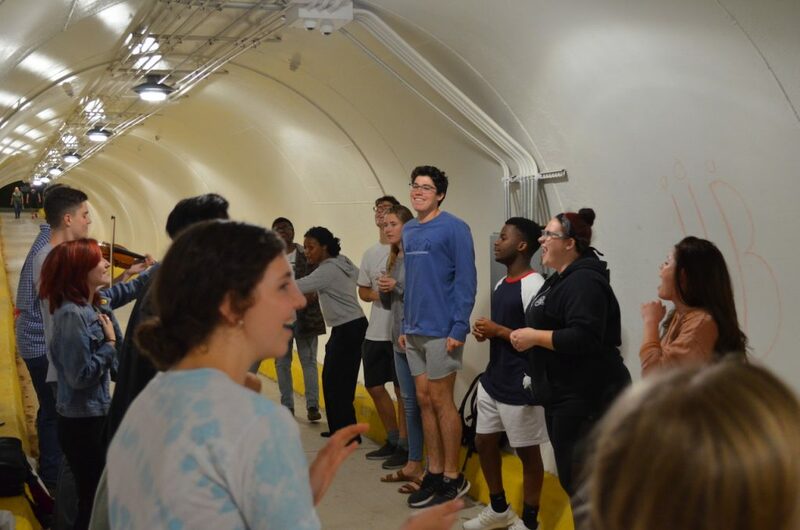 Every Friday night at 9 p.m., the East campus tunnel reverberates with worship from dozens of students participating in Tunnel Worship. Entering its fifth year, Tunnel Worship is a student-initiated time of prayer and worship that has become a favorite for Liberty students. When Braxton Mann, a senior and one of the founding members of Tunnel Worship, visited Liberty for College for a Weekend he saw the tunnel as an excellent location for acoustics. When he became a student, he brought a few friends with him to jam in the tunnel but ended up getting more attention than expected. Week by week, the number of attendees increased. Word spread around campus and other musicians started participating. Mann explained that people may be drawn to Tunnel Worship because of the personal and intimate feel it generates. “(Tunnel Worship is) a place where people can meet with God and not feel any pressure to do anything but be there and worship,” Mann said. Nicole Miller, another senior at Liberty, began participating in Tunnel Worship her freshman year as a vocalist. Today, she plays an integral part in planning and rehearsing for each Friday night. “Tunnel Worship is pretty close to being my favorite thing I’ve been a part of at Liberty,” Miller said. For Miller, Tunnel Worship is an important addition to campus life because it gives more freedom to students to worship in their own ways. Mann added that not every student has church affiliations that line up with the university, but all are still welcome to seek after and praise God. “If you come from a very charismatic church or a very liturgical church, there’s a place for you,” Mann said. Miller said that Tunnel Worship is powerful simply because of the environment. With echoing sounds of voices surrounding students, Miller said the experience is both freeing and compelling. Over the years, regular attendees have posted about their experiences using the hashtag ‘#tunnelworship’ and reached out on social media and in person to tell Tunnel Worship members about how it has impacted them. Miller said it is a privilege for her to see students worship and pray over each other week after week. “People are worshipping God out of their own volition, in their own way, letting their own hearts speak and letting the Lord speak to them,” Miller said. 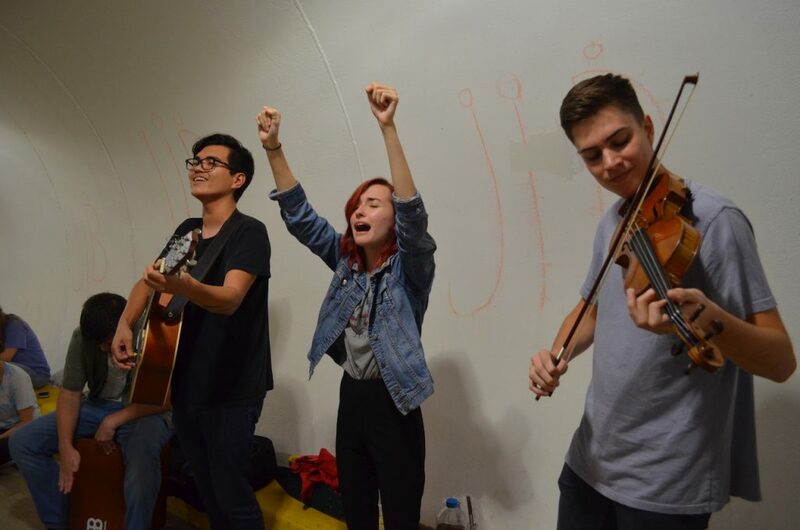 Tunnel Worship is not just powerful for the students who show up – it has an impact on the musicians as well. “It’s been such a healing and peaceful, kind of eucharist moment in the week to remind myself what’s important,” Mann said. As leaders like Miller and Mann prepare to graduate this year, they are looking back on their experiences with Tunnel Worship with nostalgia and looking to the future in the hopes that Tunnel Worship will become a student-led tradition. Mann emphasized that the legacy of raw and nonjudgmental worship should remain as Tunnel Worship gets passed to new generations. “No matter who you are or where you come from, you have a resting place and a safe space to seek out God (at Tunnel Worship),” Mann said.